So I have spent the past day or so trying to get my head around what Yellen and the FOMC were trying to achieve on Wednesday. It certainly wasn’t the massive volatility that followed in the FX market after the announcement and into Thursday. Once again, lack of liquidity and extreme positioning seems to have driven multiple s.d moves in the big currency pairs. But now the dust has settled the main market reaction has been flattening of the curve, with around a 25bp hike taken out by the end of 2017, a marginally weaker dollar and higher equity prices. The latter two will no doubt be welcome by Committee, but less clear that they wanted even lower rate expectations to deliver it. 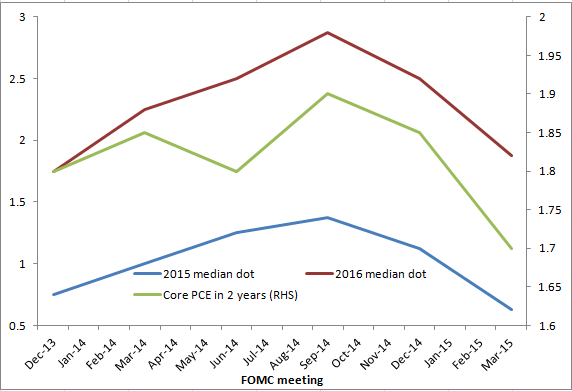 For the past year or more there has been a large and growing divergence between the FOMC “dots” for rate expectations and market pricing. In simple terms, the FOMC members had felt that once lift-off began, that the hiking cycle would be around half as fast as in 2004, such that rates remained below their long-run level even once the dual mandate had been achieved. The market, on the other hand, saw rates rising even less quickly, and could be argued was consistent with the much discussed “secular stagnation” theory. Rates would have to stay very low due to a structural demand deficiency, in order to meet the inflation objective. In other words, the neutral real rate is still negative and would remain so for at least the next few years (see here for my thoughts on this issue). In my post before the meeting on Wednesday (here), I said that I didn’t think that there had been sufficient economic news, nor change in rhetoric from FOMC members to warrant a material move down in their rate expectations. That turned out to be wrong. While the much anticipated removal of “patient” from the statement put June on the table for the start of the normalisation process, it was the shift down in the dots that generated the big reaction. So the median FOMC voter now thinks that rates will rise even more slowly, albeit still somewhat faster than the market expects (particularly further out). When asked at the press conference, Yellen said that the lowering in the dots reflected three things: lower GDP growth projections, lower inflation projections and lower estimate of the long-run, or natural rate of unemployment. It is worth taking each of these in turn. On GDP growth, the central projections are around one-quarter of a percent lower in each of the three years. What is odd about that, is that Yellen’s explanation in the press conference was that weaker net export growth was the main factor (o/w the dollar and weaker world growth were the drivers). That makes sense for 2015 and maybe even 2016 (although the multipliers look a bit big to me), but I struggle to see how that works for 2017 as well. Rather, it suggests to me that the FOMC have become worried about the extent to which above trend growth can persist, even with lower rates than they had previously expected. Is this the FOMC starting to come around to the secular stagnation argument?? On inflation, there was a material shift down in expectations for 2015. That is not surprising given the energy shock. But what was more striking to me was the downward move in 2016 and 2017 (something I said I would be looking for in my preview). How does one square it with the revisions to the growth forecast and the change in the dots? The chart below shows how similar the shape over time of the (roughly) two-year ahead inflation forecast has been to the median dots for 2015 and 2016. This is where the FOMC’s approach to presenting their forecasts gets a bit confusing. 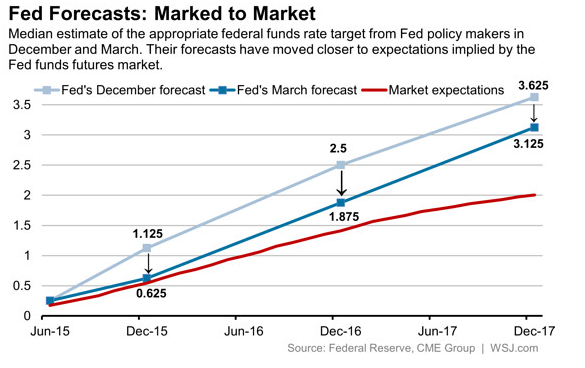 Unlike many other central banks, the FOMC do not condition their GDP, unemployment and inflation projections on market expectations for policy, but instead on their own expectations. That ought to mean that, assuming they want to meet their mandate within a two-year horizon (the usual period used by central banks), they should come up with an interest rate path that delivers inflation of 2% and full employment within two years. If they don’t, then the rate path should be adjusted accordingly. In other words, it is the rate path itself that should be the message for the market, not some other confusing combination of factors (as opposed to say, the BoE, where the inflation forecast should be the main message as it implies whether the market expectations are in line with the MPC’s). Within a reasonable degree of uncertainty, the FOMC have more or less delivered this over the past year or so in their median forecast. But with the inflation forecast now down at 1.7% for end-2016, by which time the effects of the energy shock and stronger dollar should have unwound, maybe the dots should have been lowered even further? It may be that this meeting is an aberration, and that the global deflationary mentality that currently pervades will abate over the coming months. But the big message I took away from this meeting was that the FOMC are moving closer to the BoE in terms of their message. Rate hikes will be gradual and limited. Maybe not so gradual as the market believes, but clearly a shift in their thinking. They think the time to start is approaching, but they expect the pace of hikes to be slow. What are the risks to this apparent shift? One is that the headwinds that have pushed against the US economy from the financial crisis are abating more quickly. Yellen said in the press conference that they were receding. If they are truly receding, then the neutral real rate is rising and the Fed will need to start hiking just to maintain the current degree of stimulus. Otherwise growth will accelerate, unemployment will fall faster and wage and price pressures will go up. That would require a more aggressive hiking path to avoid overshooting. Of course this is not far off what Yellen would describe as being a data-dependent approach. What she doesn’t say is that may be the result of a policy error. Another risk is around financial stability. Nothing looks to be stretched at the moment (apart from govt bonds of course), but there are clearly risks of asset bubbles so long as credit remains so cheap. It is disappointing that since Jeremy Stein left the Committee so little has been said about this topic. Of course, the risks run in the other direction too. If the secular stagnation crowd are right, then it seems unlikely that the Fed will hike even as slowly as their latest projection. I am still in the optimistic camp, and so am not a big buyer of the secular stagnation argument. That the Fed is inching that way is interesting, and a challenge to my views. But I still think they will ultimately need to hike more quickly than the market is pricing. I think the same regarding the FOMC meeting, reduced growth outlook and a decreasing speed of interest rate hikes caused, in my view, an over reaction by the the market. What interests me the most is inflation, how can it be persistently low when the fed have printed hand over fist and the cost of borrowing has been so low for this long? The only thing that makes sense to me is a liquidity trap, those $2.4 trillion of excess reserves held by depository banks is unprecedented and tells me: 1) the banks don’t want to lend because they know rates will be higher in the future, or 2) they are worried about the effect interest rates rises will have on economic growth. Glad you are enjoying the blog. Hopefully not too dry. Your inflation question is a good one. And I think your answer goes some way to explaining it. There is no doubt that the traditional monetarist channel has broken down. Although I would argue that this was true of quantity approaches to monetary policy long before the financial crisis (look back at the disasters of the 1970s in the UK and elsewhere for reasons why quantity approach to monetary policy is fraught with danger). That said, when you reach the ZLB, quantitative options are essentially all you have left. The great fear that many had of inflation getting out of control following the QE programs hasn’t come to pass. Why? Because the massive increase in base money has not resulted in a similar increase in broader aggregates such as M2. The monetary base has expanded by on average around 30% yoy since the start of the crisis, while M2 has risen by around 6%. Ie the velocity of money has fallen sharply. So why didn’t we see a big pickup in lending and hence broad money? I’m not sure I would say it was the result of a liquidity trap (in the traditional Keynesian sense). The Fed and other central banks have (as well as ‘independent’ researchers) have produced just about enough evidence to show that QE genuinely did lower yields. It is harder to say how long that effect persisted, but if you believe it was the stock of asset purchases, rather than the flow (and to be fair, many do not) then yields are still being suppressed, so long as the assets are on the Fed’s balance sheet. Instead, I would put it down the massive balance sheet adjustment that needed to take place in both the banking and household sectors. Much of the banking sector was bailed out, via forced capital injections. But even then, needed to go through a long period of adjustment in order to meet the new regulatory requirements that were bearing down. That meant that they were not seeking new lending opportunities in anything like the usual way (and of course, credit quality was also heavily impacted). On the household side, the debt overhang that resulted from the housing bubble (and subsequent crash) meant that they were in a position of having to reduce debt, not increase it. Hence the demand for credit collapsed. The only sector that moved in the opposite direction was the government (the extent to which they did/should have has obviously been heavily debated by Krugman and others). So for me, the big question is whether those balance sheet adjustments are close to complete (in aggregate at least), which should free up the supply of credit, and at the same time see an increase in the demand side. I think signs are pretty good on this. Banks are as well capitalised as at any time in recent memory, and household debt/income is now below pre-crisis levels. Corporate balance sheets have been in pretty good shape throughout, so the big question is whether they are now ready to increase investment spending more aggressively. It may well be that all those actors are worried about the impact on the economy of future rate increases. But the most recent Fed Senior Loan Office Survey suggested that banks were easing credit conditions on the expectation that the economy was improving (see: http://www.federalreserve.gov/boarddocs/snloansurvey/201502/fullreport.pdf). If they were worried about future rate hikes on either their own balance sheet or the broader economy, it wasn’t really showing up in this survey. I think we will start to see inflationary pressures pick up. The labour market is tightening and I expect wage growth will start to pick up. Unless that is accompanied by much stronger productivity or a margin squeeze (both of which seem unlikely to me at this point), then inflation will follow. There is no doubt that the deleveraging of households, and banks, has in one form or another has kept a lid on inflation. Additionally I believe there is more deleveraging to come as interest rates rise and as the cost of repaying debt becomes more expensive. I think you are right to focus on M2, and why the velocity of money has dropped, and I agree that yields might stay low so long as the assets bought by the Fed remain on it’s balance sheet. I suspect though that yields right now are also low in the US because the yields on offer elsewhere don’t look great for one reason or another, mostly as a direct response to the Greek crisis and the flow of money back to the US as a result of the impending ‘tightening’. But you have to wonder, in an economy doing so well, and with tightening expected soo, why are the yields so persistently low if there are better opportunities to lend in the real economy and why are excess reserves so high? These reserves don’t form part of the Feds balance sheet, so currently the Fed has little direct control over what banks do them, so in essence that is $2.4 trillion in monetary base waiting to be used (waiting for who knows what) and which couple multiple due to the nature of fractional reserve banking thereby stoking inflation and forcing the Feds hand on the speed of interest rate rises. The only tool the Fed seems to have is the new power to pay interest on excess reserves which they believe will act in counter to inflationary pressures which would result from their lending to the real economy. Good information, and good insight. I try to span as many different views as I can to become more rounded. The drier the better in some ways.